Dean of the Florida Black Caucus State Senator Arthenia Joyner reviews Hillary Clinton’s record of commitment to African Americans with colleagues on the steps of the Old Capitol. 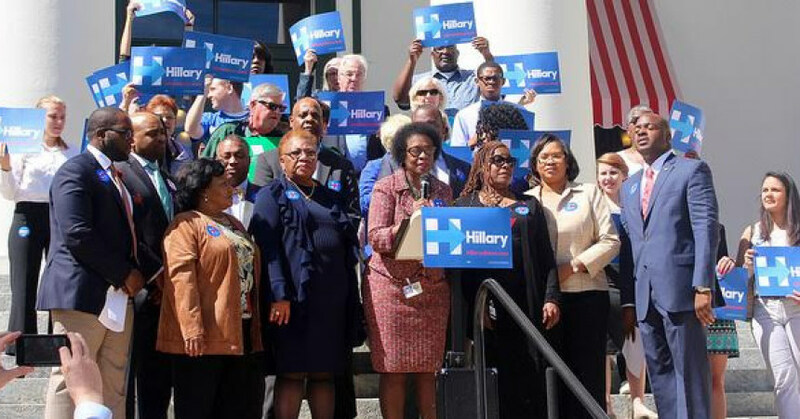 The endorsement strengthens Clinton’s presence in Florida as Black voters continue to grow and impact election outcomes. Among eligible voters, Hispanics and Blacks are on the rise while White voters are declining. According to Patrick Oakford, a senior policy analyst at the Center for American Progress, “It does clearly show that to win key states, like Florida, a candidate will need substantial support among voters of color. Voters of color are becoming a larger share of the electorate,” making up 38 percent of eligible Florida voters in 2016, up from 35 percent in 2012. 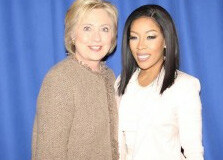 [dropcaps]L[/dropcaps]ove and Hip Hop: Atlanta star K. Michelle has endorsed Democratic presidential candidate Hillary Clinton. The Florida A&M University alumna said, “I will be actively supporting and campaigning for Hillary Clinton throughout this term, she is a woman who you should know. A woman also counted out. I relate to her. I’m placing my energy in people and things that evoke CHANGE.” Michelle says she supports Mrs. Clinton because they share a commitment to education and HBCU’s in particular. 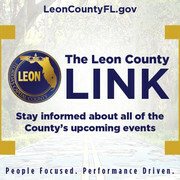 “As a graduate of FAMU, my focus is on Historically Black Colleges and Universities. The legacy of these schools has to carry on, and we have to find a method that make it easier for my people and minorities to advance.” The star joins other celebrity supporters that include John Legend, Uzo Aduba, Kerry Washington, Snoop Dogg, Queen Bey and others.